Artemis is back home and he is slowly getting adjusted to the fact that his last adventure took him away from his family for three years. He now has twin brothers who are quite a handful, and fairy blood runs in his veins. On the whole, despite these changes in his life, Artemis' future looks wonderfully rosy - until the day when Artemis' mother gets mortally ill. When Artemis hears that his mother does not have long to live he calls for help. In no time at all Holly Short - his fairy friend – is at his door, and Foaly the centaur is helping Artemis diagnose what is wrong with his mother. The news is not good. Apparently Angeline Fowl has a disease that not too long ago killed a large number of fairies. The only known cure is a medicine that is made using the brain fluid of the silky sifaka lemur. Unfortunately the last known silk sifaka lemur died eight years ago when ten year old Artemis Fowl brought about its demise. Regretting more than ever what he did all those years ago, Artemis decides that his only choice is travel back in time to save the lemur before his ten year old self can condemn the poor animal to death. Artemis knows all too well how dangerous time travel is. There also is the concern that he could somehow change the future if he does anything drastic to the past. He will have to be extremely careful. Thankfully Holly Short immediately volunteers to go back in time with Artemis. Perhaps, with her help, he will be able to complete his mission, save his mother, and not cause too much of a disruption while he is at it. 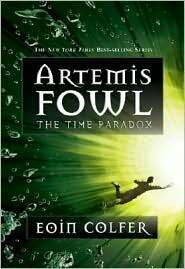 In this thrilling, funny, and surprise packed novel, Eoin Colfer once again takes Artemis Fowl on a wild and action packed adventure. For the first time Artemis is truly able to appreciate how ruthless and heartless he once was. Seeing his cold-blooded ten year old self is quite a shock to the system. In this delightful book Eoin Colfer not only tells a great story, but he also develops his characters along the way. Now Artemis is not only a better human being with a conscience, but he also has something that is truly priceless – friends who care about him and who are willing to risk all to help him.